The evening started with me driving over to pick up Sooz at her parents house which is a short way from the Convention Center at around 5pm. It was about 15 degrees at this point by the way. We paid $4 for parking my salt-mobile, $7 each for admission, and we were on our way to being broke within seconds of getting our admission tickets. Before you read of what I got tonight, I wanted to pat myself on the back for sticking to my game plan of going for all Pujols and 2001-2004. I did end up buying mostly those years with 1 or 2 later ones I needed. I also didn't end up buying a ton of Yankees which I tend to do. I made it about 8 feet into the show floor before spending $4 bucks on a Pujols 2005 Ultimate Collection card #'ed 030/475. The lady who I purchased this card from was wearing a necklace with the number 33 in all diamonds, interesting thing I noticed. My next stop was to TNT Cards booth, I know him from eBay (sad, I know). There I was able to pick up a 2005 Topps Bazooka Robinson Cano and a 2006 Topps Turkey Red White Robinson Cano, both for a buck. They didn't have change at the time and told me I could have the cards, and if I remembered to bring the 2 bucks later great, if not I could keep them anyway. Moving right along I picked up a 2006 Bowman Chrome Pujols for a buck, got my change and returned to the previous vendor to pay them back. Next on the money sucking trip was me and Sooz not finding each other for a while since we tend to like to search for different things, and end up always talking to different people as we go. I was searching a box that was marked "all cards half-off", meaning they were overpriced and trying to look like a great deal. This same guy has the same sale going on for about 2 years now. Sooz calls me and tells me there is a guy with a box of Yankees and Pujols cards for a buck a card. I put everything back and went to where she was. I picked out a bunch of cards, checked them against my checklist that I had with me and walked away from there with 22 new Pujols cards and 1 Jeter that I liked. I know, I have issues but I'm not even done yet. Onto the (cringe) Beckett booth to submit my 2 Pujols rookie cards. I chose 45 day turn around because I am cheap at $9 per card. $13 for shipping, $7 for insurance for a grand total of $38. Great. In my defense, ask Sooz what she thought of my cards... They are in really good condition, probably 9's or better. Then I find another eBay seller I have talked to at shows before and have bought stuff from many times, Rookies & Stars. There I discovered a box of Yankees, as well as star cards like Pujols. We chatted for a bit, then I called Sooz to come over because it was a Jeter jackpot from what I saw. 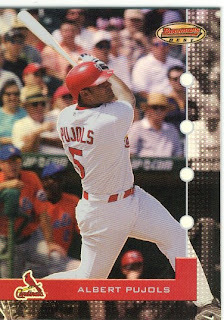 I ended up finding 6 Pujols cards, including one ROOKIE, a 2001 Fleer McGwire/Pujols card. I also picked up 4 Jeters, 1 A-Rod and 1 Phil Hughes card I didn't have. 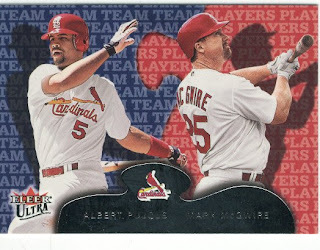 These cards were 6 for $5 bucks, which was nice, I just wish he had more Pujols cards. We talked for a great deal of time about eBay, having a store on there, and his physical store. He told us quite a bit of interesting info about how his store has been doing as well as answering my questions about prices to have a table and booth at the show. My final stop, yes it's over here, was to the supply table I like. There is a couple who gets a booth at every show and sells supplies at a very reasonable price. I made some small talk here on 2 separate trips today, they are super friendly and Yankee fans. We purchased 5 packs of penny sleeves for $2, and a pack of super thick toploaders for $3, and I got a two row box for myself. I probably should have picked up a binder, but it can wait. Sooz can tell you all about her adventure since hers might have a bit of different information. I scanned a couple of cards to show a few of my favorites. 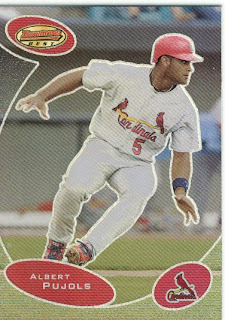 I particularly like the Fleer Ultra Pujols because when he played the OF there weren't many, if any others of him fielding his position and this was a great shot. 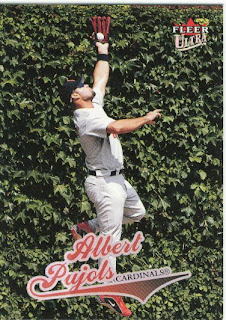 Him catching a fly ball at Wrigley Field. P.S. 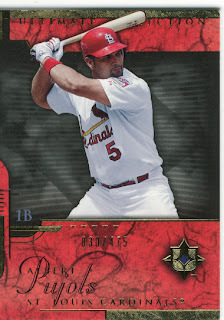 Not one vendor that was selling recent singles had Pujols UD X XPonential 2 to finish those off. I didn't want to make an entirely seperate post about the items, I got so I am just putting it in the bottom of Marie's post. I'm also don't have an as much detailed account as Marie's. The main part to know is that I got 52 cards (49 Jeter) for $50 in the end. I'm thrilled. There was only vendor that I paid more than $1 for a Jeter card, and to him I paid $2. I got a Jeter short-print also for $2. Autos and game-used cards are far too much money at these shows, so I stuck to singles. I probably would've done the same thing. Those supplies were super cheap. I can only hope to find those deals when I go to the card show in Raleigh.